Welcome to the latest series here at JosephSangl.com – “Greatest Thing I’ve Learned From …” In this series, I am going to be sharing the greatest things I’ve learned from financial and leadership experts. I hope you enjoy the series and will join in the conversation to share your favorite learnings from these leaders! It was December 2, 2002 that I experienced my IHHE Moment (I Have Had Enough Moment) and determined to change my financial future. One of my brother’s had mentioned this guy named Dave Ramsey, so I bought his book, Financial Peace Revisited. The greatest thing I learned in that book were Dave’s 7 Baby Steps (HERE). They provided a terrific roadmap for me to walk out of my financial mess and into financial freedom. I actually printed out the 7 Baby Steps and we (my bride and I) wrote down a goal date to achieve each one. Thanks Dave – that’s why you are one of my Financial Heroes! What is the greatest thing YOU have learned from Dave Ramsey? 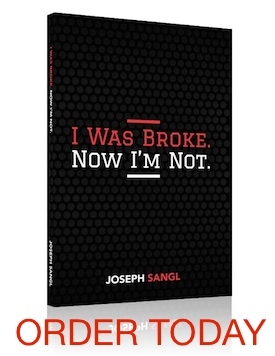 Hi, I enjoy ramsey, but joe sangl, you are my financial hero….you are very down to earth! Re: spouce and money….. It’s not about thinking a like but rather thinking together! We began to win when we stopped pulling against each other and started to work together. Ramsey rules!!! His show is on AM 680 in Atlanta and I am a very frequent listener! His simple, “bare bones” approach to money is based on common sense and logic, something many people don’t seem to have enough of these days. Unfortunately, lack of funds and sponsorship by the right groups of people keeps guys like Dave Ramsey from reaching a bigger audience on Satellite or FM stations….sad! Um… Dave Ramsey is on Sattelite. Sirius 161 at 9pm ET. and also, Fox business is simulcast… so you can catch him there with his TV show.